General Dynamics - Global Imaging Technologies design and manufacture a full portfolio of high-performance electro-optical infrared (EO/IR) cameras and camera systems, motion control products and optical systems that provide our customers the clarity, accuracy and reliability to successfully complete their mission. 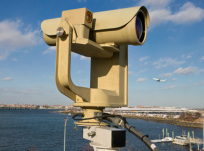 General Dynamics - Global Imaging Technologies electro-optical infrared (EO/IR) camera systems deliver uninterrupted surveillance of your perimeter so you can accurately identify, classify and, if necessary, engage threats at long-range. The General Dynamics U-Series uncooled short- to mid-range thermal cameras are designed for applications demanding high reliability and low cost of ownership. The VU systems are affordable multi-sensor solutions, integrating an uncooled thermal camera, an electro-optical camera and other available sensors onto one of our Vector pan-tilt systems. The VU-80 is a dual-field-of-view, short- to mid-range thermal imaging system ideal for surveillance applications demanding high reliability and low cost of ownership. With an integrated thermal imager, long-range visible camera and precision 360° positioning system, this system is ready out of the box for plug-and-play operation. The Z-Series offers ruggedly reliable mid- to long-range cooled thermal cameras designed to meet a variety of mission requirements from wide-area surveillance to long-range targeting. The VZ systems are versatile multi-sensor solutions, integrating a cooled thermal camera, an electro-optical camera and other available sensors onto one of our Vector pan-tilt systems. The VZ-1000 offers four infrared fields-of-view for extreme long-range detection and identification. With an integrated 55x zoom visible camera and Vector pan-tilt system, the VZ-1000 offers plug and play integration with perimeter surveillance systems.